Each offseason comes filled with its share of fears and hopes for the upcoming year, and the biggest question is always the same: Will my team be as good as I hope, or as bad as I fear? While the UConn Huskies are by no means a strong team, BYU’s 35-10 win was convincing enough to allow me to say that I think Bronco Mendenhall’s tenth season is going to be a good one. Connecticut was only 3-9 last year, and came in with a new coach this season. The Cougars came out in dominating fashion, scoring twice in a thirty second stretch of the first quarter to go up 14-0. 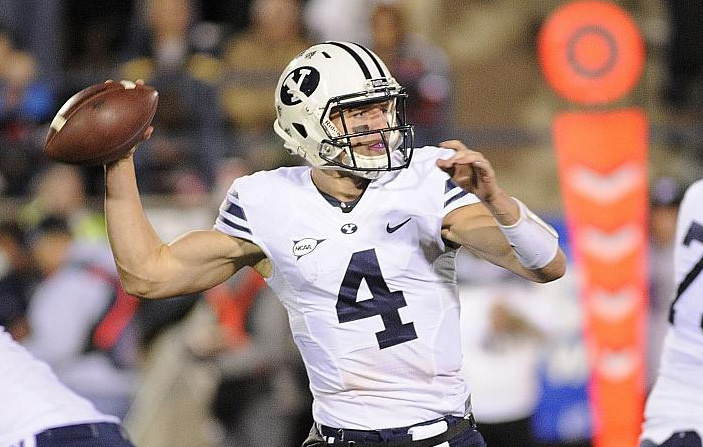 On their first possession, Taysom Hill led the Cougars on a 15 play, 75 yard touchdown drive, which featured ten runs and five pass attempts. UConn’s ensuing possession lasted only one play, as JR RB Max DeLorenzo fumbled the ball, which was recovered by Bronson Kaufusi. On the very next play, Taysom Hill connected with Mitch Mathews on a 26 yard touchdown pass that sealed the game. Much of the game was marred by referees who were all too eager to throw flags on nearly every. single. play. However, even in what grew into a dominating win, there were some lessons to be learned. Here’s a look at what we did well, and what really needs to improve going forward. Taysom Hill. I mean, wow. The guy came out and threw 28/36 for 308 yards and 3 touchdowns.. The completion percentage of 77.8 was a welcome change after last year’s season average of just 53.9%. He looked like a completely different passer, though he definitely retained his “escapability”, as he ran for an additional 97 yards on 12 runs, to lead all Cougar rushers. Our offense. In the vacuum left by Cody Hoffman, and the one game absence of Jamaal Williams, the rushing and receiving were done by committee, and they were done very well. Including Hill, six Cougars rushed for 205 combined yards. These were led by Hill (97 yards and 2 touchdowns), Paul Lasike (49), and Algernon Brown (35). On the receiving side, nine different Cougars recorded at least one reception, with six of them having three or more catches. Mitch Mathews, Terenn Houk, and Adam Hine each scored a receiving touchdown, and Mathews led all receivers with 62 yards. In all, the uptempo, Robert Anae offense racked up 513 total yards (308 passing, 205 rushing), 27 first downs, and 35 points. The biggest problems shown by the offense were: low 3rd down efficiency (5/13 for 38%), many penalties (though some were dubious), and two lost fumbles. Also good was the defense, which held the Huskies to only ten points and 71 rushing yards (on 31 attempts). The defense evened up the turnover score with a fumble recovery and an interception as well. The biggest concern with the defense is that they allowed 284 passing yards, which led the Huskies to 23 first downs, though thankfully, not to very many points. UConn will be hosting the Stony Brook Seawolves, an FCS team that was 5-6 last year, notably losing in a 5-overtime game to Buffalo. It should shape up to be an easy, confidence-boosting victory for the Huskies before they head onto Boise State and then their AAC schedule. BYU heads to Texas next weekend in what should still be the toughest game on their schedule, despite the Longhorn’s recent losses of both their starting quarterback, David Ash, and center, Dominic Espinosa.